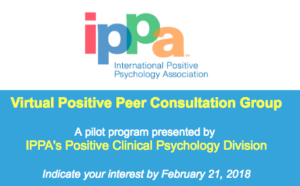 IPPA’s Positive Clinical Psychology Division is piloting a six-month, online “positive psychology peer consultation group” starting in March 2018, and is seeking licensed professionals and graduate students to participate. Applying positive psychology to clinical practice is a relatively new approach. This group will aim to provide a safe space for colleagues to support and learn from each other, and through online discussions, will develop a nuanced, inclusive and evidence-based understanding of the application of positive psychology principles to enrich professional practice.